10 MLR miles on the Small Block and Mt. Rd. 5 Mile easy run today. 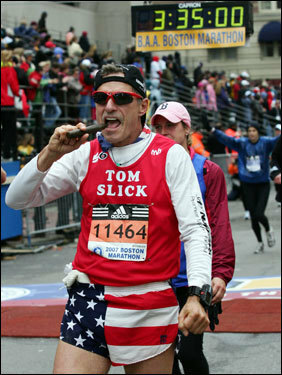 72 days till The Boston! 3 recovery miles and a full body workout. 350 setups, 200 leg lifts & 30 minutes in the sauna. Oh what a glorious day to be alive! Speaking of being alive, I turned 67 years of age today!Who would have ever thought I would have made it this far! 3 easy miles and a full body workout. 40*, NW 19 mph winds, 55% humidity, 64 days and a wake-up till Boston. 20.2 miles on the PRT & DDMR. The run started at about 38* with about a 19 to 20 mph wind that made it feel a bunch colder even though there was mostly sunshine. Oh well, I just kept my head in the game and gotter done. That hot shower after I got home surly felt wonderful! 3 easy recovery miles, full body workout, nice rest day! 10 miles on the Mt road, 42*, 60 % humidity, NW 6 mph wind. 12 miles on the Big Block & PRT. 48*, 47 % humidity, 11 mph winds.& Full Body Workout at the gym. 6 miles on the Mt Rd, 33*, 14 mph wind, 56% humidity, 1/2" of new snow on the ground. I took a page from IJR book and ran this one for fun and "sans" my garmin! 10 miles the big block w/4X800’s, 28*, Full sunshine, SSE 12 mph wind, 62% humidity. Seems like it was uphill and cold Headed out and coming back! Then a trip to the gym for a Full body workout! Now I will pickup a 4 miler tomorrow and hit my 65 mile week goal. 5 easy recovery miles, 1X800, 42*, s 17 mph, 39% humidity. Full body workout at the gym. My long run day was interupted today by a never ending snow storm. I did manage to get out for a 5 miler out of 20. Boo! I'll try to do better tomorrow. Rest day - this could be a step-back week. 10 miles on the mt rd. 22*, 6 - 10 mph wind, 46% humidity. Snow covered roads w/ a 22 inch snowfalls. 11 miles on the big block & Porter Rockwell Trail (PRT). 20*, 15 to 20 mph winds, 48% humidity, Still pretty rotten running conditions, but what you see is what you get and you never know what you’re going to see on race day at the starting line!!!! Just do it ! 5 miles today on the easy block. (1 mile warm up, 2 miles/4x800, 2 mile cool down) 22*, 6 to 14 mph winds, started snow at @ 4:am and continues now at 4:15 pm, then to the gym for a w/o. 5 mile tempo run on the PRT. 27* felt like 17* in 20 mph winds, 48% humidity. Even though it was a sad weather week I still hit the low end of mileage spread for the week.Sure hope the weather is a little better this next week when I shoot for. 70 mile week. 20 LSD miles today on the small block and Mt Rd. 22* at the start and 33* at the end of the run, 15 mph winds, 39% humidity. It snowed last night so there was a little bit of fresh snow on the roads and sidewalks.